My favourite ride in the park, even if some fat lady's restarints came off and I had to wait 30 minutes for it to start up again! I love the Pre-lift section on this thing. I had no idea it was there and was very, very fun. The rest of the ride is very forceful and while not as forceful as the original Nemesis, It still made it feel like my feet were going to come off. 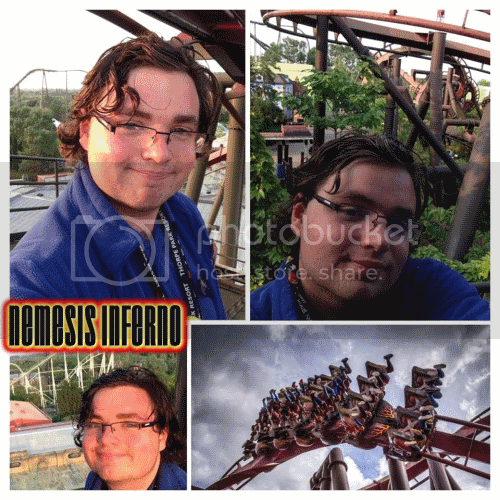 I love working on Nemesis Inferno, it is one of the best rides to work on! It was also the first ride I got, so it makes it even more special to me. Inferno is so much better than the original, and is so much more beautiful! I'll agree it is a great ride but it has nothing on the original! Nowhere near as forceful and lacks the closeness to the ground that Nemesis has. I've lost count just how many times I've ridden this coaster this year. It really is ridding well. Thekingin64 wrote: It has nothing on the original! Nowhere near as forceful and lacks the closeness to the ground that Nemesis has.